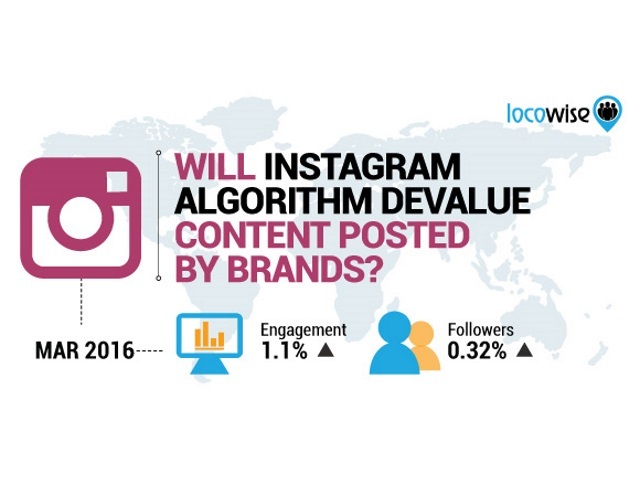 Efforts by brands on Instagram to encourage users to follow them in advance of its shift to a Facebook News Feed-type of algorithm paid off in March. Average follower growth was 0.32 percent of the total audience, which was up 60 percent versus February. However, that figure was down 83.59 percent from April 2015. Post engagement rate was 1.1 percent of total followers—again up compared with February (30.95 percent) and down sharply from April 2015 (60.71 percent). Brands posted 2.43 times per day, and 91.23 percent of those posts were images. The engagement rate for images was 1.13 percent of total followers, while it was 0.91 percent for videos. The algorithm should be a good move for the platform. It will hopefully bring new life and more growth and engagement for those that publish great content that people want. The likelihood that you’ll be interested in the post. Your relationship and history of interaction with the person posting. The timeliness of the post. We can expect something like the Facebook News Feed algorithm. Some factors that will impact it would be the format of the post, the organic engagement on the post and the amount of time people spend on the post. Readers: What are your thoughts on Instagram’s impending move to a News Feed-type algorithm?